Dungeonman 3 is another sequel to Videlectrix popular text-based adventure, but this time they have included awesome jaw-dropping graphics and animation. You're bound to be impressed by the gorgeous backgrounds and detailed character portraits. If that isn't going to floor you, then the humor and poor usage of fake Old English will. The game is rather short and easy puzzles are of no help, but what you get in return is a satisfying experience and an amazing tribute to classic adventure titles from the past. After spending years as a starving artist, you've managed to catch the eye of a influential gallery director. He wants to see some new work, and you've got a terrible cold that is draining your creativity. You'd better find a cure for the common cold, and fast! The Winter Rose is an excellent adventure game by Alex van der Wijst which took a year and a half to develop. The story is about Rose, a young archer on a quest to save her father and rid the land of the evil ice-dragon. For a solo effort, the game does showcase excellent use of limited resources. 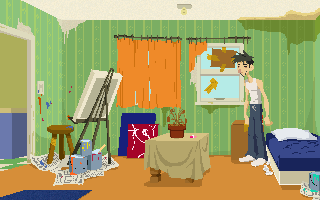 Backgrounds are hand-painted, and a lot of nice touches have been added to create the right atmosphere. The animation is great, snowflakes are beautifully animated, and throwing in footprints is genius. But what is most impressive about the game is the writing. Every item has a description based on your actions, a feat rarely seen in other AGS titles. You will be rewarded with quite a few chuckles if you attempt to click on everything you see, because of the witty script. Verdict? 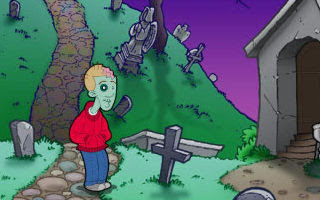 Fans of classic adventure games won't be disappointed with this one. Short demo versions of full games, scheduled to be released in 2007. Kaptain Brawe: A Brawe New World is a new adventure series from Naphtalite Productions, featuring a slightly absentminded titular character, his sidekick and an accompanying robot. 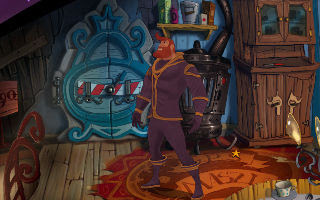 Graphically reminiscent of classic 2D LucasArts titles, a verb coin called The Badgotron is used for interaction with objects and characters. The story kicks off with a rescue mission, but soon after Kaptain Brawe finds himself branded as a fugitive from justice for a crime he did not commit. 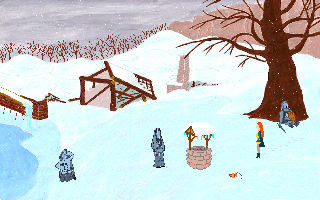 Nearly Departed is an adventure game made using a relatively new scripting engine named LASSIE. As a professional illustrator working for Disney, John Green has done an amazing job with the graphics for this upcoming release. The final version will include voice acting. No full screen option for the demo, unfortunately. Special editions for each of these games are for sale.